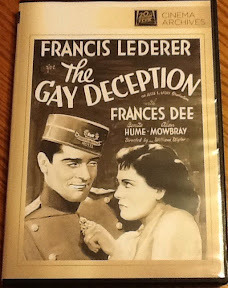 A long out-of-print classic from director William Wyler, 1935’s The Gay Deception was one of the Oscar winner’s earliest successes. 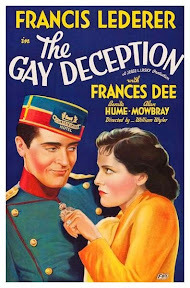 A gender flipped version of the same mistaken identity premise he would bring to life once again in his 1953 masterpiece Roman Holiday, Deception derived its comedic plotline from the idea of a royal subject pretending to be an average Joe. And while it pales in comparison to the film that introduced the world to Audrey Hepburn, it’s still a charming example of the type of wish-fulfillment movie-making that was especially popular as a source of escapism during the Great Depression. Centered on a hardworking secretary who wins a five thousand dollar sweepstakes out of the blue, while Mirabelle (Frances Dee) is advised to put the money in the bank to enjoy a lifetime of accrued interest – long-tired of office life and in desperate need of a break, Mirabelle ventures to New York to live like the characters in her favorite films. Told the most she can hope for is a month of pampering before her money runs out, Mirabelle is stunned to discover that the difference between the reality of high society is nowhere near as exciting as the stuff of celluloid fantasy as she spends most of her evenings going to the movies alone. 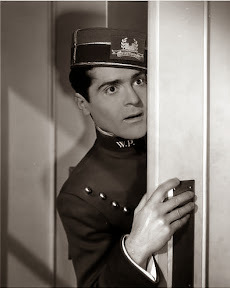 While some of the hotel’s other rich and powerful guests treat her with the icy reception of your typical high school clique, Mirabelle finds that she can’t escape the attention of a persistent yet suspiciously overconfident bellboy (played by Francis Lederer). Really a prince in disguise, the two start off on the wrong foot as (not understanding the value of money or the effect of unsolicited negative opinions) he destroys her expensive yet overly decorated hat that he feels takes away from her looks. But after he gets continuously fired and rehired (courtesy of calls from a conspirator at the consulate), the two feisty, fast-talking leads fight and flirt their way into the obligatory big reveal. Even though it follows the genre conventions (which admittedly were fairly new at the time) to the retroactive letter, it’s a classy picture the whole way. Foreshadowing the success that Wyler would have throughout his prolific career, Deception’s success as a fine film in its own right owed much to the involvement of those working on both sides of the lens from its Oscar nominated writers Stephen Avery and Don Hartman as well as a young Preston Sturges (who wrote a song for the picture) to its energetic cast. While unfortunately the hero’s conceited personality grows old fairly fast, you have to applaud the boldness of Twentieth Century Fox to serve up a flawed lead, which in retrospect is quite refreshing given the interchangeably bland pretty boy archetypes that currently populate contemporary romantic comedies. Still, fortunately for the audience, The Gay Deception nonetheless improves as it continues and with it so does the male lead’s characterization as Lederer begins to change once he’s called out on his arrogance by Dee. Ultimately forgettable yet frothy and fun, the film (which was revived by the studio in time for its Fox Cinema Archives DVD release last month) is a wholly enjoyable find for film buffs and Wyler fans alike who are eager to seek out more hidden gems from the noted perfectionist’s five-decade spanning career.